Hi readers! 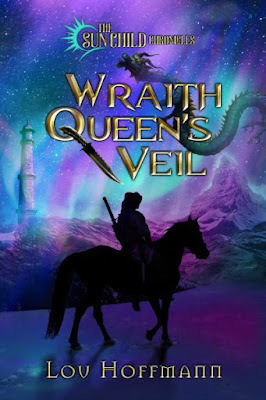 I’m Lou Hoffmann, very happy to be stopping by here on my blog tour celebrating the release of Wraith Queen’s Veil, book two in The Sun Child Chronicles. Thank you to Sandra and the My Fiction Nook people for hosting me, and thanks to all of you for reading. The Sun Child Chronicles, like a lot of fantasy stories, weaves a pretty complex plot, and right about now that’s something I’m grateful for, because blog tours are interesting propositions from an author’s perspective. It’s necessary to come up with ideas to blog about that are either fun, big news, or in some way meaningful; the ideas have to flow naturally from the book the tour is about; and whereas you have to reveal something, you have to guard against revealing too much. Usually, after the first few posts you write, the job gets challenging. 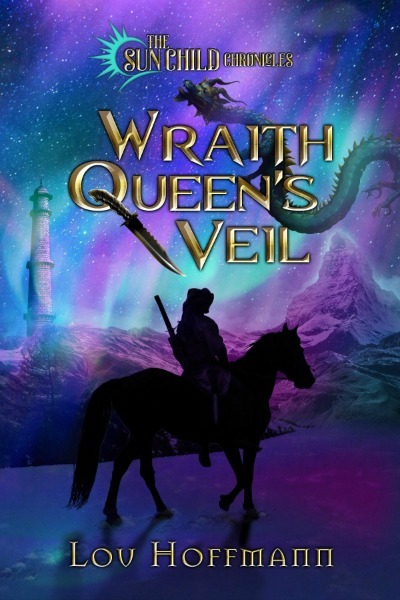 But take a book like Wraith Queen’s Veil, with its carefully crafted interlocking plot and subplot threads, and you’ve got a fountainhead of material to choose from. I’ve written a few of the posts for the tour already that focus on Lucky, the fifteen-year-old protagonist, and his adventurous quest, and of course all the other goings on revolve around him , but at this point in the series, he’s not even aware of them all. In Key of Behliseth, Lucky was living in a fictional town, situated in a fictional basin (round valley) with some unusual geological features—like Black Creek Ravine—in central Northern California. Right—our earth, but different. In this case quite a bit different than what we might encounter, say in the towns we live or work in, the valleys our cities are fill, the rivers we cross on our daily commute. Because Black Creek Ravine, which essentially cuts Valley City into halves and creates a wilderness inside the city, had for millennia been the location of at least one portal, or gateway, between worlds. …Only one is left. His name is Henry George, and he’s a Condor. That isn’t the only thing that makes him quite a singular individual, but again that’s a story for a different post. What I’m getting to today is that while Lucky’s back in his home world, Ethra, Henry George remains in California, and he’s determined to change that. You see, he’s fallen in love with the Lucky’s uncle, the warrior Han Shieth. When Lucky left Earth, he opened up another portal—one that was a lot harder to avoid seeing—and Henry watched as Han—with the help of something that looked an awful lot like magic—led his battle weary troops through that great big door…. Well, I won’t tell you more. This seems as good a place as any to introduce you to Henry. Here’s an excerpt from Wraith Queen’s Veil. The Condor circled the flooded plain, and although death called him as it would call any vulture, enough humanity remained within the shape-shifter that his always-empty belly took second place in his concerns. He had just met the first man to truly pique his interest in years, had fought alongside him against a horrid enemy, and had lost him, all in the space of a few hours. Han. That had been his name. When their hands met in a handshake, Henry had felt a shock like electricity run up his arm to set a flame in the birthmark on his shoulder, a sun with twelve rays. The pain had been real, physical, but somehow sweet, as if Han’s touch answered some question he’d never realized he was asking. And he felt it too. I’m sure of it. The Condor, who was also the man called Henry George, alighted atop a tall pine standing on the ridge where Han had gathered his people before they… what? Exited the world? They’d disappeared through a frightening, swirling blackness above the waters. Henry looked into it from his high perch and could only think of it as a black hole. But certainly it led somewhere—to another world, perhaps. Else why would Han and his company have willingly entered it? Henry was seriously considering going through that door, but it was a frightening prospect. Maybe after I eat, he thought, procrastinating as any hungry condor would. He turned his head and lowered his gaze to the edges of the flood, where food for a condor was abundant in the wreckage. He dove to pluck a freshly drowned, fleshy mole from a turbid eddy near the flood’s edge, but as he swooped upward to carry it away, a motion caught his eye, an animal struggling in the direction of the… swirling black-hole thing. And Henry, whose powerful vision never failed, couldn’t believe his eyes. It’s Maizie… and she’s carrying Lemon Martinez. This couldn’t be more strange—and heartbreaking. Maizie was the dog Lucky had rescued as a pup and kept with him during his year on the streets. Henry hadn’t known that, though; not until Maizie had joined in the otherworldly struggle alongside him and Han, helping to fight the evil—yes, evil—darkness they’d met that day. And Lemon Martinez? A cantankerous-seeming, fuzzy gray cat that Henry still knew nothing about. Almost nothing. He did know the cat had sacrificed himself during the fight to save the life of a strange girl who seemed little more than a willow in the wind until she made magic with her songs. That girl had gone through that strange Portal after she’d helped the others. Most likely Lucky had left that way too, Henry believed, even though he hadn’t seen the boy go through. Now he guessed Maizie was trying to get through, thinking she’d find her best friend on the other side. Henry knew of nothing that could explain why she was trying to take the cat’s body with her, but he’d seen so many inexplicable things that day, he couldn’t assume it didn’t make sense. But Maizie wouldn’t be able to get through that Portal, no matter how devoted, with the cat or without. The Portal, or whatever it was, hung from the fallen stones in a pentagon shape. At first the bottom boundary had been just above the surface of the water—already impossible to swim through. In the intervening thirty or so minutes, the water level had already fallen as the flood spread across the valley floor and through the ravine. Maizie wouldn’t be able to swim through and would have no footing from which to jump. And the magical stairway Han and his cohort had climbed to get over that threshold had disappeared. So you see Henry’s plans are foiled for the moment. But, readers, he can’t let the idea of getting to Han Shieth go! Seriously, would you, if you were in his shoes (or feathers as the case may be)? That’s all the story I can give you today, though. To discover the rest, you’ll have to follow up in Wraith Queen’s Veil. See how I did that? Tricky, right? Still, I hope you enjoyed this post and excerpt, and will enjoy reading the book. By the way, both or either of The Sun Child Chronicles books can be had 35% off simply by entering the code SUNCHILD2 at checkout at the Harmony Ink Press store. The offer is good through 10/20/16. And don’t forget to enter the giveaway! Four prizes, multiple chances to enter. Check it out! Thank you for joining me today. Here’s a link to the entire schedule for my blog tour. I hope to see you along the way.